"I knew I wanted a tattoo, but the commitment to one idea was freaking me out. However, I took an Art of Mexico class and when I learned the term 'Nepantla' I knew that was it. Nepantla is a term in Nahuatl that roughly means 'on the border' or 'in between.' It seemed perfect. I got the tattoo done at a place off Pacific Coast Highway in Sunset Beach, California. It was a birthday gift from an ex that I was still friends with. 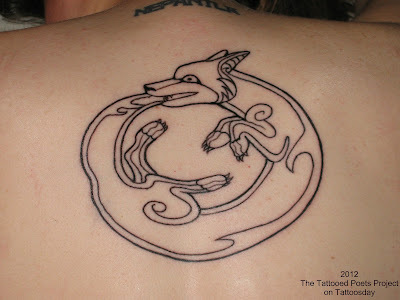 The next tattoo I got was of a coyote ouroboros. I love the coyote as a trickster symbol in Native American myth and I was also very drawn to the symbolism behind the ouroboros, the life-death-life cycle. I did not relate to the more classic ouroboros images of a dragon or a snake so I asked a young artist named Natalie Robles to design the coyote ouroboros for me. The tattoo was done at Atomic Tattoo off Hollywood Boulevard [in Los Angeles]. On the drive to a wedding in Arizona, my friend and I decided to get almost-matching tattoos. It seemed that since we were both people who had tattoos that we should have at least one on a whim. It had to be something simple since we didn't have a chance to research the tattoo shop. We settled on cat silhouettes. The next tattoo I had done [seen at the bottom of the back in the top photo above] was at a shop in Lake Forest, California. While walking to class one day at Cal State Long Beach, a flyer grabbed my attention – it depicted an awareness ribbon designed to resemble an Asian character. I saw it and I simply knew. My quid pro quo\ tattoo was done at Wicked Ink in Knoxville, Tennessee. I had heard the phrase literally translated to 'what for whom' and I had known for some time I wanted a tattoo that embodied my fascination with the structure of power. 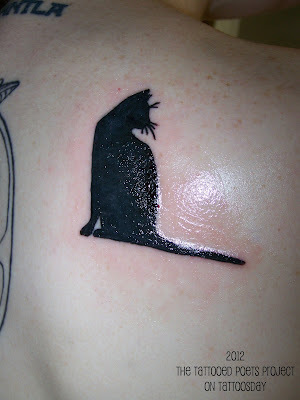 Again, I wanted something simple because I hadn't researched the tattoo shop – I was on another trip. 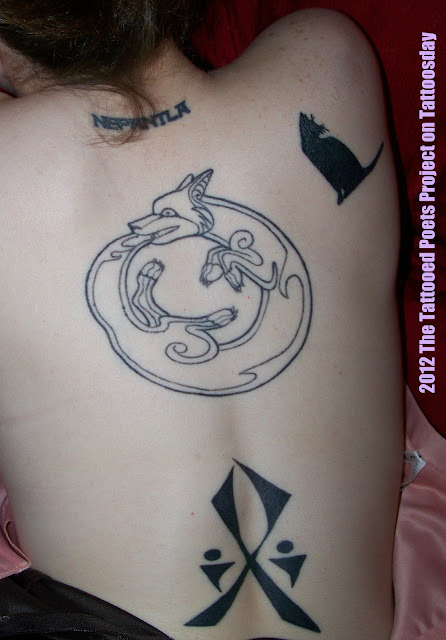 I chose a female tattoo artist because it occurred to me that all my previous tattoos had been done by men." Shannon Phillips earned an MFA in creative writing from Cal State University Long Beach. Her work has been published in Pearl, Verdad, RipRap, Rectangle, and her poem “Plum” placed second in Beyond Baroque's First Ever Poetry Contest. She previously taught ESL for two years and now edits Carnival, an online literary magazine. 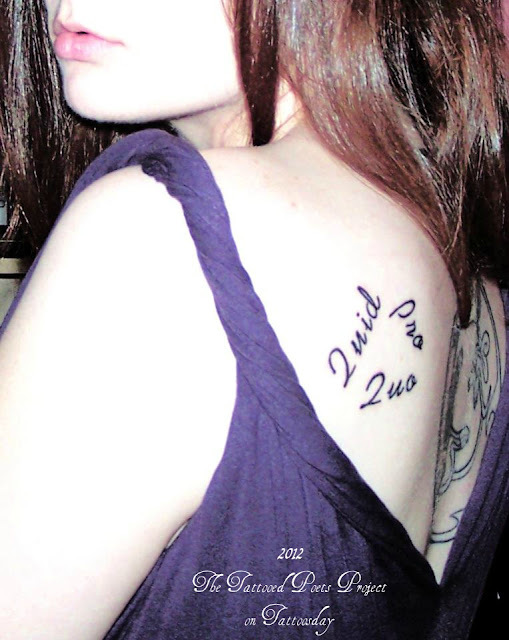 Thanks to Shannon for sharing her poem and all of her tattoos with us on Tattoosday. I'd also like to thank her for referring us to Eric Morago, who appeared on the Tattooed Poets Project here, earlier this month.